So this past weekend in Guild Wars 2 was the Lost Shores event, a large update that added a new level 80 zone, a new dungeon, new stat and item types, a refer a friend trial weekend…and a three day event chain. Now, I love ArenaNet. However, it’s pretty clear that they tend to both vastly underestimate the number of people who will be concurrently playing their content, as well as being highly ambitious – overambitious even. And it’s both of these things that came together in a nasty snarl this weekend that caused the events to not go off as they should have. Things kicked off Friday afternoon with an attack on Lion’s Arch. Awesome idea, I must say. LA is a large city that is essentially a trade hub that links all of the main five races together, as well as many of the minor races. Of course any attack on the city would be immediately defended! However, where this fell short was the fact that the entire event took place in a very small area. 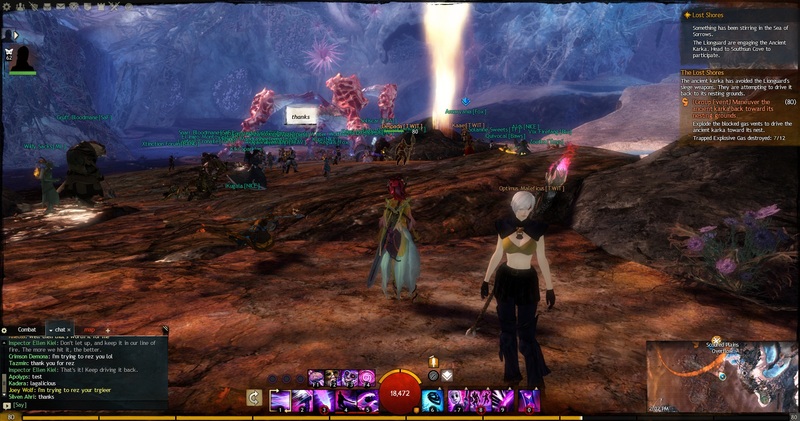 Lion’s Arch is huge – and yet the entire attack event happened in a small area around Claw Island Portage Waypoint. Because of so many people in such a small area, this resulted in a huge amount of lag and disconnects for people. At one point there was a tweet from the Guild Wars 2 account saying to try mapping out of LA and then back if you were encountering a lot of lag. That did work…to an extent. You have to break combat to waypoint somewhere, and all it was effectively doing was moving you to another overflow. Parties weren’t joining overflows together, this meant that you lost your event progress…and even the least laggy of overflows (we eventually got on a good one) was still full of lag. The followup scavenger hunt was also something of a mess; the first step was utterly vague and we had only stumbled on what to do on accident. The next steps had other issues – one had so many people surrounding it that the “intimidate the NPC” event would not trigger completion for many people who then had to sit there through several more attempts, and one NPC broken entirely. I eventually completed it, but now I have three useless items in my inventory, with no idea if I should keep them or delete them. The Saturday event I was not able to attend due to work, but from what I’ve heard from guildies, it was essentially a non-event; it didn’t go off at all on many servers or bugged out. I had been annoyed about having to miss it initially but it bothered me less afterwards due to how it went. I missed another mini scavenger hunt but I’m also not fussed on that. Sunday’s event though…this is where underestimating and ambition crossed to make things a horrible mess. The idea behind the event was awesome. The mechanics of it were amazing. 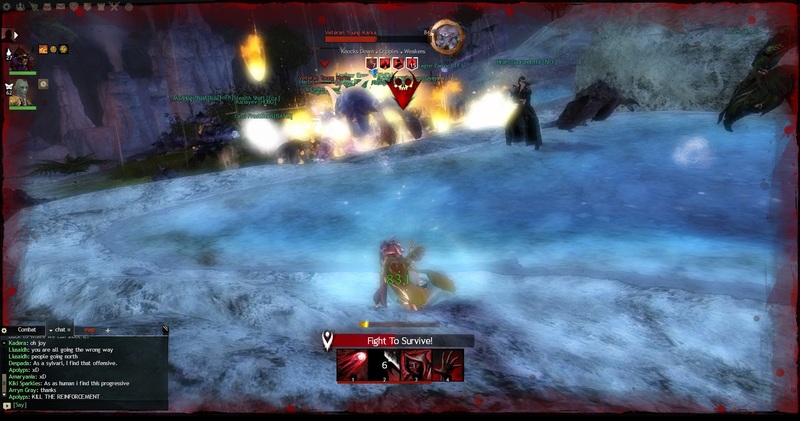 A huge group event that ranged over half the zone that consisted of planting explosives in a karka hive cave, finding the Ancient Karka (basically the broodmother/queen), chasing it back home through a number of smaller events, weakening it with the explosives, fighting it even further, and then one of the coolest finishers to a boss fight ever…by all means, the event had the potential to be great. It was just too big. It took two and a half hours to complete on the overflow I was on. There were major issues during the first stretch of the fight where massive numbers of karka would suddenly render, oftentimes right on top of you, and instantly kill you. Rolling karka were frequently impossible to notice until they steamrolled you down. That part alone probably over an hour, simply because no one could see what was going on and people were dying too quickly to res and hence there was a lot of running back from waypoints. A very common occurrence during this event. Stage two was finding the Ancient Karka and driving it back home to the cave so we could blow it up. The process in which you did this was actually very cool – the Ancient Karka itself could not be defeated directly at this point, so you had to start out by getting it’s attention by literally dropping a tree on it. Another step was destroying nests to pick up debris that you threw into steam vents to bombard the karka. Between these steps though, were the ones that were a mess. Defeat the reinforcements! This is where the biggest problems, for many of the people I was playing with, happened. There were so many reinforcements and so many people fighting them that the lag hit…and this wasn’t lag like before. No, this was lag where attacks and skills were not firing at all. This was lag where different people had different amounts of event progress showing. This was lag where you would have no idea what was going on or where you were, and suddenly drop to defeated from full health in an instant because you’d been getting beat up on for some time but simply weren’t aware of it. 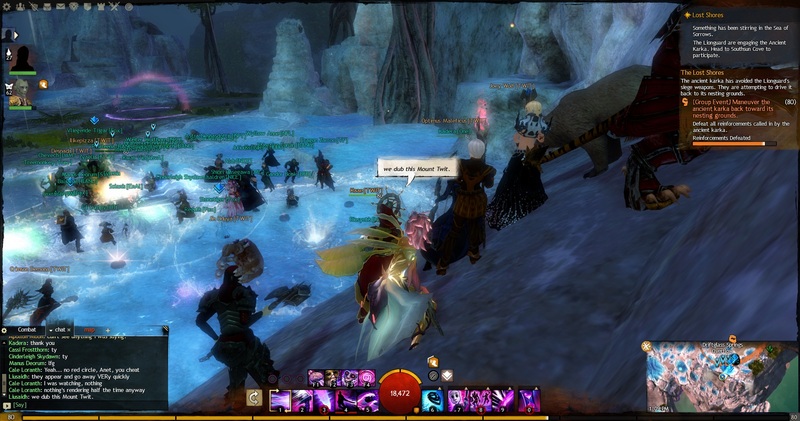 This was lag where /say, /party, /guild, /squad, and etc. chat were not working. This was lag that I had never seen the likes of before – I’ve had lag issues before in Claw of Jormag fights where it’d take a second for my skills to trigger and go off…but never lag so bad where I would break out of combat between attacks or skills going off. Essentially this was lag where it rendered the game unplayable. Eventually, a few of us did stop, found ourselves a nice safe cliff face to sit on, and claimed it as Mount Twit. Optimus’s armor broke…and yes, I had to screenshot this. Teehee. The final phase – destroying the webbing covering the explosives, chasing the Ancient Karka down to the bottom, beating the crap out of it, and then finishing it off – was the smoothest part of the event, ironically enough. I don’t know if this was because of people simply giving up and leaving, or because of the speed of it – that entire phase took maybe 15 minutes tops…but I have a sneaking suspicion it was for a third reason. Disconnects. Many, many people DCed from the game around this point, and were unable to reconnect. One of our party members had this happen, and said that he was unable to access the login server. Posts on twitter show that this was a common issue – and seemed to be the most common with EU players that were participating in the event, regardless of what server or data center they were playing on. There have been issues with the EU servers from the very first BWE, but really…by now this should be something that has been cleared up. Especially since people who got disconnected were unable to claim their rewards for participating in the event. The reward chest made me feel better about the mess…to an extent. From what I’ve gathered, it seems that everyone at level 80 got two exotic weapons/armors, two rares, as well as a 20 slot bag and an exotic accessory that had +25 to every stat. Very nice. Doubly nice because precursors for legendary weapons were in amongst the exotics that could be gotten from the chest – I got Leaf of Kudzu myself, and a friend got the Lover. I generally have absolutely abysmal luck with drops and rewards in this game, and everyone who was in vent with me at the time can attest to my reaction. Sure, Kudzu isn’t the legendary I’m going for, but selling that certainly helped on the quest for the legendary I am working on (Bifrost). At the same time…I feel really, really bad for the people who disconnected during their event and could not get their rewards. The rewards for this event were amazing, and justly so. The event itself had potential to be amazing. But as it turned out…it was such a mess. I got very frustrated with it at about halfway through the “drive the karka back to the hive” segment and was considering logging, but we decided to stick it out just to see what the rewards were going to be. I’m glad we did. At the same time, though, I fully understand why so many people were so upset with how it went down. I do recall it being said that server populations were being raised for the weekend due to the trial weekend. I believe that this could have caused many of the overcrowding issues that then caused the severe lag that happened in the events. Raising the server caps lead to there being more people in shards and overflows, which made things way too overcrowded. As annoying as the “this world is full” messages were when we were trying to get everyone in our group together on one overflow, lowered overflow populations – having fewer people in an area – would have likely helped immensely. One of the theories we had on how it was taking so long for the event to complete was because people could not see what was going on due to rendering and culling issues, and could not attack due to lag. The event was scaling up for the number of people in the area, but many people were essentially unable to participate, and hence it became much, much harder and longer than it should have been. Still, it wasn’t all bad. A new level 80 zone is always welcome, though it was definitely scarce on resource nodes (where are the resource nodes?! ), and a bit more variety in the enemies would be nice. Southsun Cove is in fact incredibly pretty and has a nice variety of landscapes to explore through. The new dungeon, Fractals of the Mists, is very cool and has a lot of neat mechanics to it that make it definitely an interesting experience, though I think I learned last night that my limit for a day is a single cycle of 6 fractals plus the boss fight after number 6. The Bags of Wondrous Goods you can get from bosses in dungeons are also quite awesome, as well as the new items we’ve found as drops – I got several rings with new stat combos on them, as well as backpieces, which were not useful for me but I can definitely see them being useful for others (I say, thinking of a friend who was bemoaning a lack of Magi accessories at level 80 just last week, and now those can be gotten!). The event was a rocky one, for sure. I wish that it had gone smoother so that it would have been more enjoyable for people. I wish that the game hadn’t fallen into the trap of underestimating and overstretching their ambition again (come on, where’s guesting? The complete silence on that topic is starting to really annoy me – the game’s been out for nearly three months now!). I’m hoping that the good is kept, and the bad is learned from. And while I’m not really against one-time events like many people are…if you’re going to give out such good loot, make it so everyone has a chance at it, not just people who are lucky enough to be in the right time zones and don’t have previous obligations.